RIO DE JANEIRO, Jun 25 2013 (IPS) - Matheus Mendes Costa, a 21-year-old university student, spent 13 hours in a three-square-metre police station holding cell after he was arrested in this Brazilian city for allegedly assaulting police officers and destroying public property. The economics student was arrested in the early hours of Tuesday Jun. 18 at one of the many demonstrations held in hundreds of Brazilian cities in the wave of protests initially sparked by a hike in public transport fares, which was later reversed. Costa says he was detained when he was participating peacefully alongside his father in the demonstration that night in Rio de Janeiro. Harsh and arbitrary police crackdowns are seen by analysts as one of the factors that have contributed most to fanning the flames of the mass anti-government protests across Brazil. Leftwing Brazilian President Dilma Rousseff herself called for restraint from the forces of law and order in her speech to the nation on Friday Jun. 21, underlining that the population has the right to protest peacefully and saying that violence and vandalism were the work of a small number of infiltrators. On Monday Jun. 24, Rousseff invited the Movimento Passe Livre (MPL – Free Fare Movement), which started the protests, to a meeting, which was followed hours later by another with the governors of the country’s 27 states and the mayors of the largest cities. At both meetings, toning down the police response was on the agenda. “I had my university backpack with me and I never imagined that anything would happen to me. The police grabbed me by the backpack and tore the placard I was carrying from my hands,” Costa told IPS. He was taken to a military police station together with 10 other people, mostly students and one homeless man. “None of us fit the profile of a vandal. A police officer tried to terrify us by threatening to launch a tear gas canister against us. The police who beat me wore no identification,” he said. Costa and the other young people had to post bail, ranging from 300 to 1,300 dollars, to secure their release. The student said there was no set criterion for the amount of bail set. “We were 10 people in a tiny cell, and not everyone was able to contact their families. The police subjected us to different forms of derision. Even the homeless man had to post bail, the largest sum of all, and we had to take up a collection to help him out,” he said. Political analysts and human rights activists reported indiscriminate police crackdowns, as well as disorder and vandalism perpetrated mainly by groups of infiltrators who looted public offices and shops, overshadowing the peaceful goals of the demonstrations. 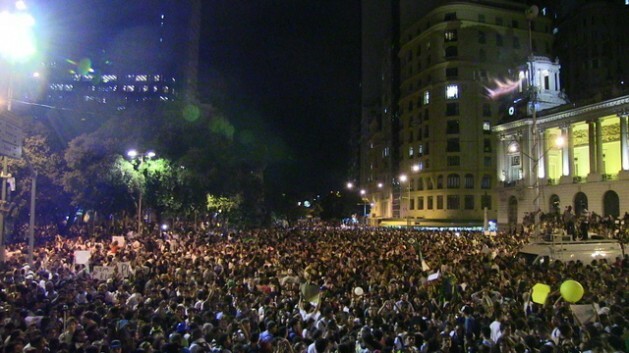 The Brazilian bar association said that in Rio de Janeiro alone, up to Friday Jun. 21, 60 arbitrary arrests had been made of demonstrators caught in battles between the security forces and groups of vandals. “I was distressed because the police did not do their job of stopping the violence, but decided instead to beat and arrest innocent people on false accusations. I had to post bail without the opportunity to prove that I didn’t do anything wrong,” complained Costa, who faces charges of criminal association. Eighteen-year-old Jorge Luiz de Jesus had an even worse time. He spent a week in jail, part of the time in the notoriously dangerous Bangu prison, where he had to share a cell with drug traffickers, thieves and rapists. Afterwards he was transferred to another prison where he mingled with 100 inmates. His case was more serious because the police accused him of carrying a grenade in his backpack. “I explained that the backpack wasn’t mine, but the police officer sprayed an aerosol in my face and said ‘Now it’s yours.’ I was framed,” Jesus told the Human Rights Commission of the Rio de Janeiro state parliament. The Human Rights Commission is gathering testimonies on dozens of cases of arbitrary arrest during the protests in the city. The state public prosecutor’s office opened an investigation into the complaints of abuses by police and military forces, especially the military police shock troops. To keep peaceful protesters from being accused of vandalism, the Rio de Janeiro bar association deployed 70 lawyers who are covering the streets, police stations and hospitals of the city offering legal aid. Felipe Santa Cruz, the president of the Rio bar association, told IPS that fascist groups had infiltrated the protests. He criticised the security forces’ lack of knowledge of safety measures to protect demonstrators from the groups who attend the marches to create violent disturbances. “The police do not have a history of repressive action, but they are militarised, and their behaviour is confrontational. This has enabled neo-Nazi infiltrators to take part, wielding iron bars, since the demonstrations began. The police ought to guarantee the right of peaceful protest, but they have wound up attacking the demonstrators,” he said. “They lack the training to police the population under normal conditions, and even more so when there are large protests. The movement was spontaneous, it won the people over, and people came out on the streets for the noblest of reasons,” said Antônio Costa. The central demand is the reform of the country, said the activist, who sees the people’s movement as reformist and not as seeking to subvert the established order, but to carry out a “moral cleansing” of Latin America’s largest democracy. As a result, he said, it is a mistake on the part of the government to perceive the movement as violent. What led people to take to the streets, he said, was a revolt against the billions of dollars spent on building and remodelling stadiums for the FIFA World Cup in 2014 and the Confederations Cup that is now being played. The 2013 FIFA Confederations Cup kicked off Jun. 15, shortly after the start of the protests, and ends Jun. 30. Rio de Janeiro will also host World Youth Day, an event for young people organised by the Catholic Church, which Pope Francis is to attend, from Jun. 23-28. And in 2016 it will host the Olympic Games. “The authorities underestimated the growing awareness among the people,” said Antônio Costa. “A great deal of political will and vast amounts of money were expended on the construction works FIFA asked for, while there are unpaid debts among our schools and hospitals. The streets have cried out in protest, and that cry must be heard,” he said.